Pipes are susceptible to freezing when temperatures drop below the 30-degree mark. While below-freezing temperatures aren’t common in North Florida, they do occur overnight during the winter. To prevent damage caused by frozen pipes, check out these five tips from the team of Ocala plumbing professionals with Sunshine Plumbing & Gas. Plumbing system designs vary by region, which means water pipes in southern homes, such as in Ocala, freeze more easily than pipes in northern homes. Up north, most homes have water pipes located within the walls, to provide insulation from dropping temps. Whereas down south, pipes are often installed outside the home. Granted, not every Florida home has exposed pipes, but enough of them do that it makes sense to recommend adding insulation as a precautionary measure. 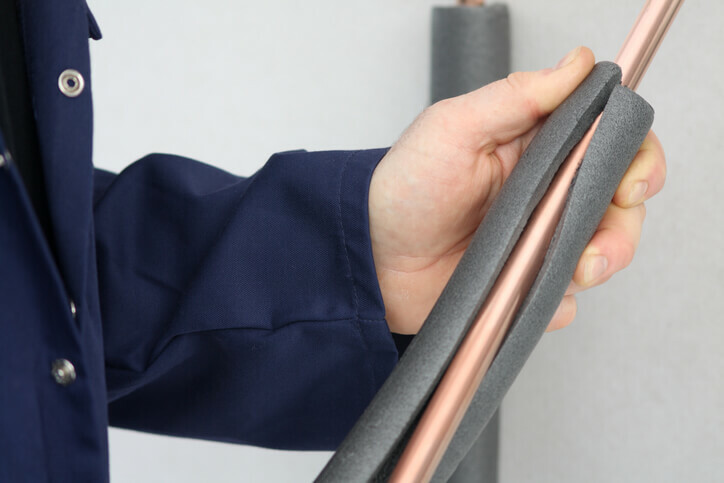 Foam pipe insulation, is usually black and resembles a pool-toy noodle,can be found at most hardware stores. The product is relatively inexpensive, although if you’re on a budget, you can save money by instead wrapping the pipes with old blankets or towels fixed with string or duct tape. Additionally, if you need help installing pipe insulation or identifying exposed pipes, our plumbers in Ocala can assist you. If your home’s water pipes are located outside, in the attic, or in another area vulnerable to freezing, and if adding insulation every winter has become overly cumbersome, one permanent solution is to reroute the plumbing. Once the pipes are indoors, they will remain closer to room temperature. So, rerouting the plumbing alleviates your concerns about frozen pipes. People are taught at young ages to preserve water by keeping faucets shut off when they’re not in use, but a frozen pipe causes the temporary amendment of these rules. When a pipe freezes, the ice isn’t the only problem; it’s also the pressure that builds downstream as a result of the blockage. Any portion of the pipe that’s outside or exposed to cool air is vulnerable to ice formation that constrains the flow of water. As the ice expands (freezes) and contracts (melts), it pressurizes the trapped water, and enough pressure causes the pipe to burst, usually at a spot that’s nowhere near the blockage itself. Leaving the faucets (or outdoor spigots) on to release a trickle of droplets relieves enough pressure to stop an all-out plumbing emergency. After releasing pressure from a frozen pipe by opening a faucet, spigot, or valve on the same line, you can get to work clearing the ice blockage with heat. Never apply a direct flame, whether from a lighter or a propane torch. This will damage the pipe and create the risk of a home fire. A hair blow dryer is a safer tool for thawing pipes. Using an extension cord if necessary, turn on the blow dryer to high heat, point it toward the section of the pipe nearest the faucet (keeping the tap open), and gradually work down until water resumes flowing at its normal rate. Be cautious not to slip or bring the electric dryer into contact with moisture — condensation tends to form on the exterior of frozen pipes when they’re heated, which can result in puddles. A burst water pipe and its aftermath can be a shocking experience. Yet the longer you stand still, overcome with amazement, fear, or agitation, the more extensive is the water and plumbing damage. So at the first sign of a rupture, don’t hesitate; run to and turn off the main water supply valve. Since you’ll be reacting to the crisis in a half-panicked state, it’s helpful to learn ahead of time where the valve is located in your home — as it could be indoors or outdoors. If you’re not sure of the valve location, ask a plumber to point it out during your next service appointment. Although frozen pipes aren’t the most frequent cause of plumbing repairs in Ocala, they do pose problems for local residents every winter, especially if the pipes rupture as a result of the ice blockages. So even if the risk of frozen pipes occur only a few days each year, remember these tips from Sunshine Plumbing & Gas on how to prevent damage. And if you need further assistance with this or need to schedule plumbing services, please contact us today!